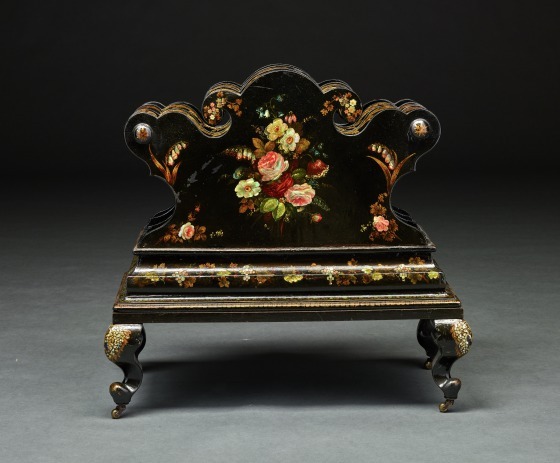 The sizable group of 19th-century English papier-mâché furniture is perhaps the most interesting aspect of the Reves furniture acquisitions. 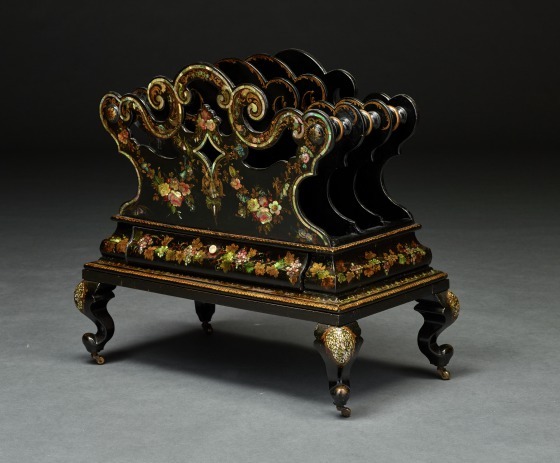 During the 1960s, when Wendy Reves was building the collection, the ornate Rococo Revival style was poorly regarded by collectors, so the collecting of such pieces was extremely avant-garde on the part of Reves. 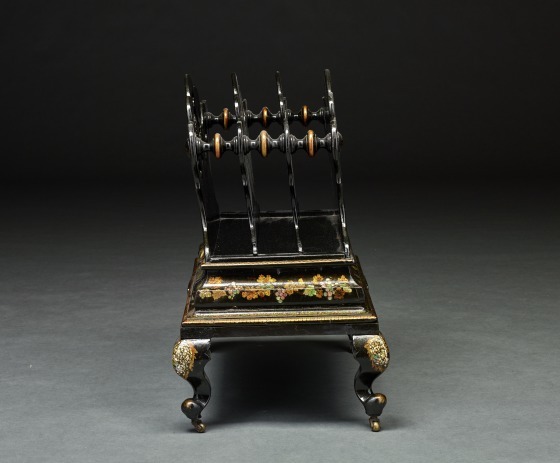 Working through galleries like La Boutique du Village in Paris and Stair & Co. in London, Reves gathered together more than twenty examples, most of which are now at the Dallas Museum of Art. 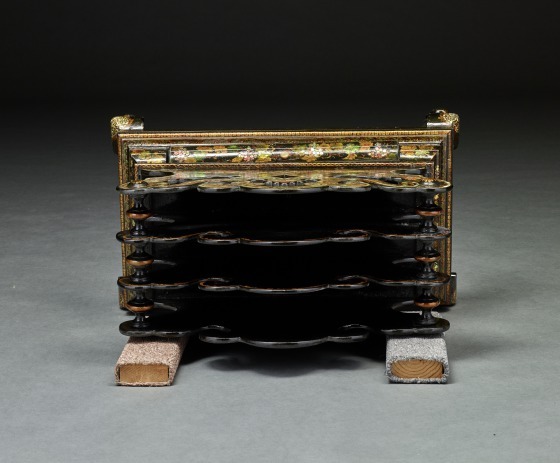 The collection is especially noteworthy because of its wide variety of forms like this canterbury. Canterburies were developed in the late 18th and early 19th centuries to hold printed matter like sheet music and magazines. 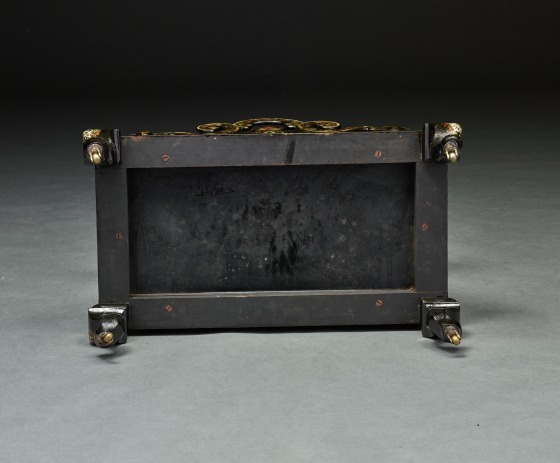 While numerous examples survive in a variety of materials, including cast iron, canterburies incorporating papier-mâché are rare because the weight of bound sheet music and periodicals weakened the paper elements over time and eventually destroyed them. Besides its rarity, the Reves example is noteworthy for its strongly scrolled form. 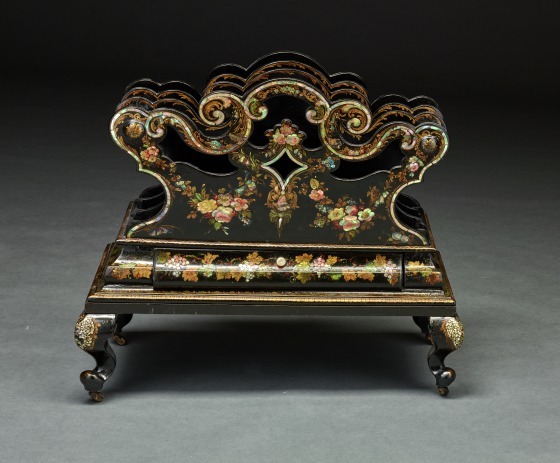 Beginning in the 1820s and 1830s, European and American designers returned to the rococo ornament of the second quarter of the 18th century for inspiration. Rather than copy these airy curvilinear forms and patterns, 19th century craftspersons gave their objects heavier proportions with bolder curves, as in this example. This style of ornament is known today as Rococo Revival. Dallas Museum of Art, Decorative Arts Highlights from the Wendy and Emery Reves Collection (Dallas, Texas: Dallas Museum of Art, 1995), 43 and 57.